The abundance of used cars for sale in New York might not really suit your fancy. Perhaps you’re looking for a truck. Why would someone do that in a city environment? Well, first and foremost, some people just prefer the size and way a truck handles. But, getting that full-size pickup truck through cramped streets might seem like an impossibly maddening feat. Alternatively, maybe you need a truck because you find yourself hauling a lot of cargo around, and a truck bed would fit your lifestyle best. Therefore, a conundrum is formed: how do you get that truck-like feeling and utility, in a city-sized version? Worry not, there are trucks out there that provide a solution, especially the midsize truck class. Since the biggest enemy in the city is size, these trucks provide a nice combination of utility on a smaller scale. Check out these four used trucks for city-living, which are listed in no particular order. The 2015/2016 Colorado have both greatly disrupted the truck market. Winning Motor Trend truck of the year awards back-to-back, and completely stomping on the competition when it comes to handling and performance. Currently, the 2016 Colorado is the only diesel truck offered on the market. With all the fame its getting, it’s not surprising that you might not know the Colorado was discontinued in 2012, and the 2015 and 2016 models are a resurrection of the vehicle. If you can afford to grab a 2015 Colorado, go for that. If you’re looking for a more affordable price, then pick up a 2012 Colorado. This truck was only offered in a four-door crew cab body style for the 2012 model year. I know what you’re thinking — way too big for a city thanks to the extra seats in the back, right? Wrong. Even with a crew cab style found on larger trucks like the Silverado or F-150, the 2012 Colorado only stretches to 207.1 inches in length. This is (naturally) longer than a car, but small compared to other four-door crew cabs on the market. It’s also sitting at 67.6 inches wide, which is much narrower than most cars. Don’t worry — it’s still got plenty of room in the truck bed for anything you want to tote around the city. While many consider the base engine to be lackluster, grabbing one with the optional V8 provides this mid-size truck with surprisingly powerful performance. The best part is, it’s offered at a very affordable price, regardless of which trim level you decide to buy used. On a side note, if you can’t find a 2012 Colorado, grab a GMC Canyon from the same year. It’s essentially the same truck, much like the Chevy Tahoe and GMC Yukon are both (basically) the same SUV. A used Toyota Tacoma is perhaps one of the best pickup trucks on the market suited to city life. While the power from a V8 engine is nice (like the one found on the Colorado), the efficiency of the Tacoma’s four-cylinder (21 mpg city/25 mpg highway) is an added perk. Couple that with the fact that the 2013 model is a four-door cab, which only comes in at 190.4 inches in length — only an inch longer than the Camry midsize sedan — and you have a truck that won’t take up any more space than a sedan. Width-wise, it’s only 72.2 inches, just half an inch wider than the Camry. Regardless of the year, the Tacoma retains those sedan-like dimensions. Perhaps the biggest reason the Tacoma is such a popular vehicle is that it’s a small midsize truck that provides the utility of a full-size one. Not many trucks can do that, and the Tacoma easily stands out as the best-used pickup truck to grab if you live in the city. Similar in appearance and versatility to the Tacoma, a used Nissan Frontier is also near the top. What makes the Tacoma better? The smaller size. The Frontier measures 205.5 inches in length. Which isn’t too bad, but it’s still nowhere close to the smaller size of the Tacoma. It’s about a foot longer than a midsize sedan, which some might feel is an issue when it comes to parking. Especially since in recent years (2013 and on), you’re only able to choose between an extended-length King-cab or four-door Crew Cab. This increases the length to that 205-inch mark and takes away from the ease of maneuverability. Combine that with the fact that the 2012/2013 sees poor fuel economy compared to a 2012 Colorado (19 mpg city and 23 mpg highway), and you have a truck that is a runner-up to both the Tacoma and Colorado. But, it’s still better than trying to maneuver an even bigger gas-guzzling full-size pickup through the streets. Of course, you could always pick up a used Ford Ranger if you’re looking for an even smaller truck. This truck is around half the size of a full-size pickup, and thanks to its smaller size and engine, it’s going to trump the midsize trucks mentioned above in fuel economy and maneuverability. Then again, that’s only if this type of truck suits you. Remember, because it’s a small truck, you lose out on a lot of utility. A smaller truck translates to a smaller bed, which means less room for transporting cargo. Not to mention, it only has room for a single bench seat in the cab. So if you need to transport more than just yourself and a suitcase during the workweek, you and your passenger will wish it had more room. But, it’s truly a compact truck, and extremely reliable. Therefore, if it works for you, grab one of these. 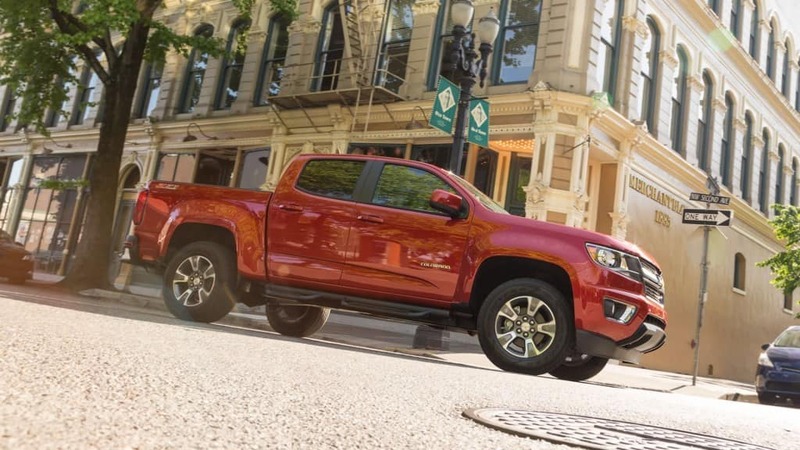 While there are a few other trucks suitable for a city environment, these stand out in the midsize truck segment thanks to their combination of smaller size and great utility. Anything bigger, and it might be a hassle to drive. Anything smaller (like the Ranger), and you lose out on that utility. It’s all a balancing game, and a lot of it comes down to preference. Make sure you figure out what you need the truck for first, and then make a decision from there.